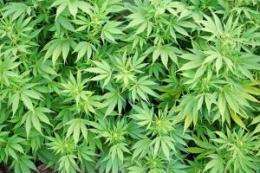 A team of University of South Carolina researchers led by Mitzi Nagarkatti, Prakash Nagarkatti and Xiaoming Yang have discovered a novel pathway through which marijuana can suppress the body's immune functions. Their research has been published online in the Journal of Biological Chemistry. Marijuana is the most frequently used illicit drug in the United States, but as more states legalize the drug for medical and even recreational purposes, research studies like this one are discovering new and innovative potential health applications for the federal Schedule I drug. Marijuana is now regularly and successfully used to alleviate the nausea and vomiting many cancer patients experience as side effects to chemotherapy, combat the wasting syndrome that causes some AIDS patients to lose significant amounts of weight and muscle mass and ease chronic pain that is unresponsive to opioids, among other applications. The university study has uncovered yet another potential application for marijuana, in the suppression of immune response to treat autoimmune diseases. The work builds on recent scientific discoveries that the environment in which humans live can actually trigger changes that occur outside of human DNA, but nevertheless can cause alterations to the function of genes controlled by DNA. These outside molecules that have the ability to alter DNA function are known collectively as the epigenome. In this study, the investigators wanted to find out if the tetrahydrocannabinol found in marijuana has the capacity to affect DNA expression through epigenetic pathways outside of the DNA itself. The recent findings show that marijuana THC can change critical molecules of epigenome called histones, leading to suppression of inflammation. These results suggest that one potential negative impact of marijuana smoking could be suppression of beneficial inflammation in the body. But they also suggest that, because of its epigenetic influence toward inflammation suppression, marijuana use could be efficacious in the treatment of autoimmune diseases such as arthritis, lupus, colitis, multiple sclerosis and the like, in which chronic inflammation plays a central role. The US Government has known about and has recognized the role that Cannabinoids can play in the treatment of autoimmune disorders for years... See patent 6630507, filed in 2003 by the US Government (dept of health and human services). Although, I believe that patent focuses more on CBD rather than THC... however, both are cannabinoids. Forget what you think you know about medical marijuana, you owe it to yourself to read up on the cutting edge research. also. FREE ! FREE! FREE! E-book - The Emperor Wears No Clothes. This is the book that started the cannabis hemp revolution. More than 600,000 copies have been sold to date. Jack wanted this information to be available to everyone, so he published the text of the book here on the internet for free. Yawn. Mrs. Candelaria, age 86,a RA patient, has known that for years. Soaks leaves in rubbing alcohol and applies it topically for pain relief. Did you know smoking too much marijuana causes deformities? There's pictures to prove it! I had some serious ocular and spinal auto-immune issues that ended up going into remission when I started regularly eating collard greens. Why should we live our lives based on how morons will react? But can we modify the plant genetically to reduce side effects from using the drug? As someone with an autoimmune disease I can vouch that marijuana is an effective treatment.